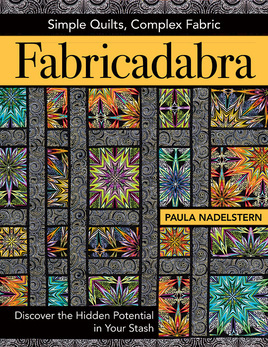 Looking at Paula Nadelstern's fabrics is like looking at works of art. And that's before you even use them in a quilt! Quilters everywhere will be thrilled with her new book from C&T Publishing called "Fabricadabra." It's tagline: Simple Quilts, Complex Fabric. Yes! What inspired your book, Fabricadabra? This book is the result of one of my internalized eurekas. I realized I could, in a word (rare for me), simplify. Take the complex quilts I’ve made and pare them down to their essential bones. Take traditional quilts and gift wrap their simple shapes with intricate fabric. Why does your fabric, including the similarly named Fabracadabra collection, work so well for this concept? Along with design strategies and unique piecing techniques, the book is about exploring the possibilities offered by intricate, charismatic textiles. One of my favorite things about this book is the Introduction titled: Me, Myself and My Process. It's not until you write about something that you understand it really well. Breaking down your own creative act, first by identifying your personal strategies and then by dividing them into so-called concepts, forces you to reflect on what things aren't as well as what they are. This exploration steers you in lots of valuable directions. In particular, it leads you to the vocabulary needed to articulate your private visual language. Favorite quilt in the book? 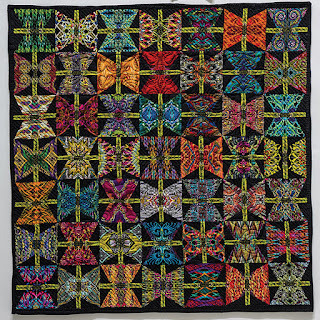 One of my favorite quilts is An Agreement of Butterflies. 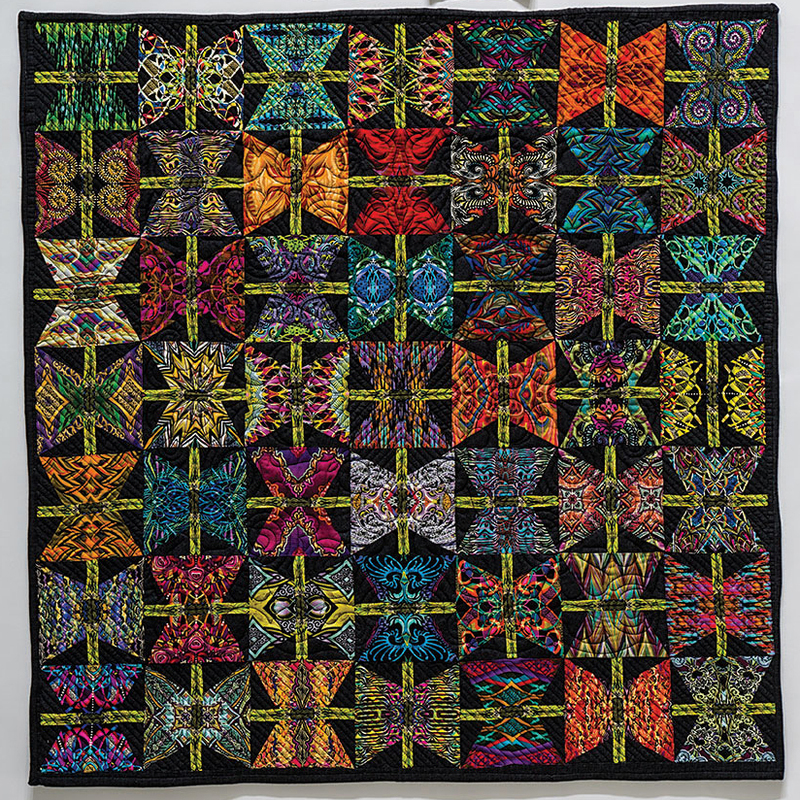 I was waiting to give my lecture to the Prairie Quilt Guild in Wichita, Kansas, when a traditional Butterfly quilt held up during show-and-tell captured my attention. In a flash, I recognized a kindred pattern capable of showcasing a gazillion symmetrical prints all at once. Choosing the fabrics bewitched me into a flow state—my name for those glorious moments when you’re so energized by the task at hand that time seems immaterial. I made many more 5˝ × 5˝ squares than needed. The collective nouns for various groups of animals and birds amuse me. A shrewdness of apes. A murder of crows. I assumed there’d be one for butterflies, but when I could not find it I made one up. Assembled from 49 different fabrics (plus a common butterfly belly and black background, for a total of 51) from my first thirteen fabric collections for Benartex, these diverse colors and prints seem to be in accord. So color me speechless when I recently searched again, six months after the initial rummage through the Internet, and finally found labels for a multitude of butterflies: a rabble of butterflies, a flutter of butterflies, or (an equally appealing quilt title) a rainbow of butterflies. But the perfect coincidence, the goose bump– laden karmic moment was the phrase “a kaleidoscope of butterflies.” It must be true; I found it on Google! Click here to order Paula's book or ask for it at your local quilt shop. Click here to read more of what Paula has to say about the book. Click here to read a recent article about Paula's work. We'll be contacting you for your mailing addresses! Great interview with Paula. Looking forward to heer book. Thank you for a wonderful Blog Hop and congratulations to the winners. May the sew happily for weeks to come. A "kaleidoscope of butterflies". I like that.